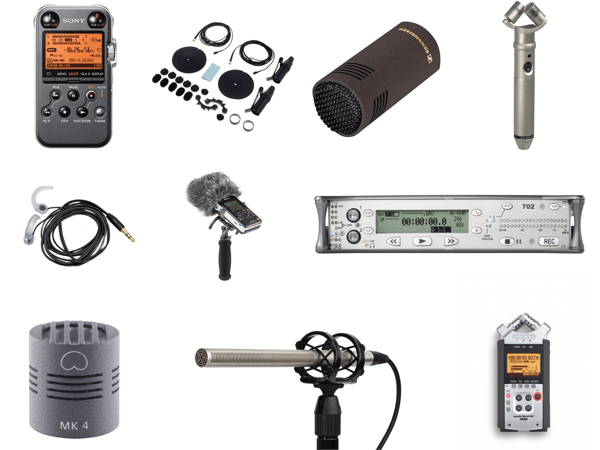 If today’s posts suddenly gave you an envy to do some field recording, here is a good buyer’s guide of equipment to start the activity in best conditions. The selection goes from the small budget to some more higher prices. Please keep in mind that a great recording at 16 bits/44.1 Khz will be always better than a bad recording at 24 bits/192 Khz… No secret here. But this is true, no need to buy the most priced gear. Field recording is first an intelligent choice of your place/subject to be recorded. Add a good knowledge of your tools. Know their limits and possibilities. Zoom Tascam, for example, offering very good recorders and often in kit form with all necessary accessories (small tripod, windshield, memory cards, cables, …) for very competitive prices. Do not start trying to save insect noises … You will fail and you will be quickly frustrated. Have a greater vision, something like the woods, the beach, a few historic sites, they should be excellent choices for a start. Learn by listening carefully to how your microphone captures sound and then start recording more detailed and specific things (like insects …)! At top of all, HAVE FUN!